It’s been a while since I’ve updated on the green velvet costume, but I assure you that there have been tons of things going on. 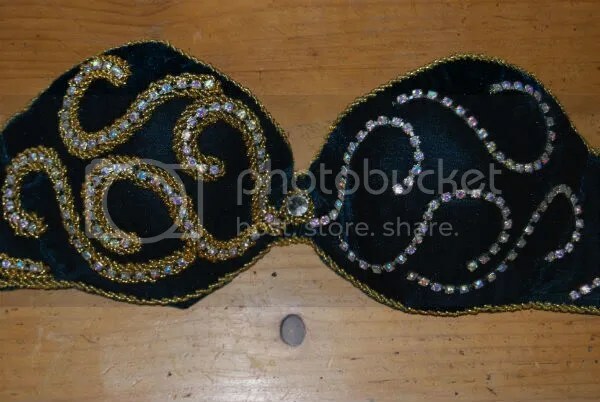 I finished the bra about one or two eweks ago and posted a close-up on bhuz, but I didn’t post it here because I wanted to give you a full update. Every curl takes about 30-50 minutes to complete. More on the back of the skirt tomorrow. I’ve blogged about the green velvet costume and how it started out with a skirt in 2006. 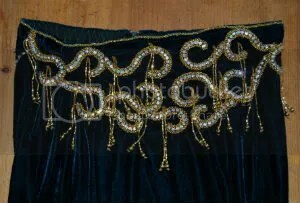 I beaded the skirt in January 2011 and let it rest, as I needed to finish the pink/gold Bella like costume before the start of April. In the back of my head, the green costume was still haunting my dreams. I was halfway already: so close to actually finishing the costume! I prepared a bra base last week and started working on the bra in the past couple of days. The good news: it looks amazing. 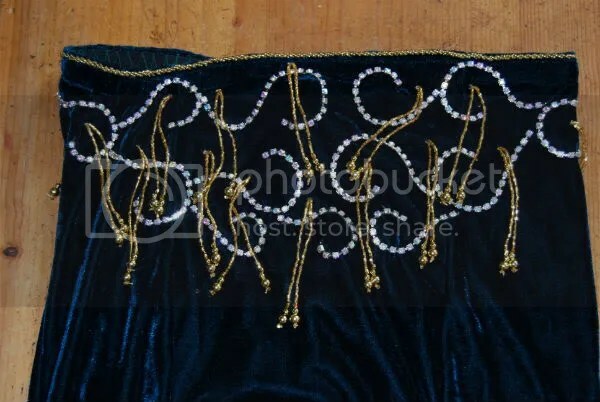 The bad news: it looks amazing because I used a different beading technique, and I need to redo the skirt. The rhinestone chain was left over from the Bella project. I need more gold beads as I finished my stash: they are Güttermann beads, high quality and expensive, but worth it. 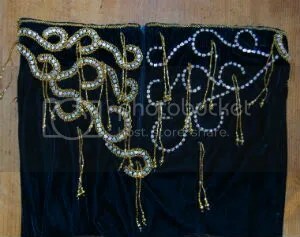 My plan is to finish the bra this week, then let it rest so I can build courage to tackle the skirt. I recently have time to work on personal projects, and one of those projects is costuming. One of the other projects is trying to reduce the amount of clutter in the house, so instead of starting on a new costume project, I decided to dig deep into the fabric vault and finally get some unfinished stuff done. That image burned itself into my brain: this was what pro dancers looked like! Another jump in time, now to the year 2006. That was the year I decided I wanted to be a professional dancer. I was still living in a student room, albeit a slightly larger one then the one before. I made a couple of costumes before, but wanted to try something new. 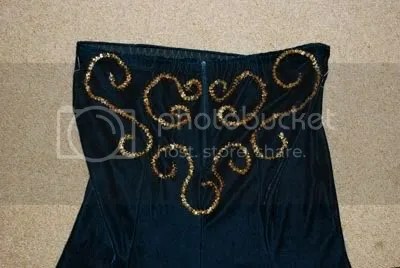 The image of the velvet bedlah (Egyptian Arabic term for a bra and belt set) was still haunting me in the back of my head. At the local fabric market I found green stretch velvet, the perfect base for my costume. 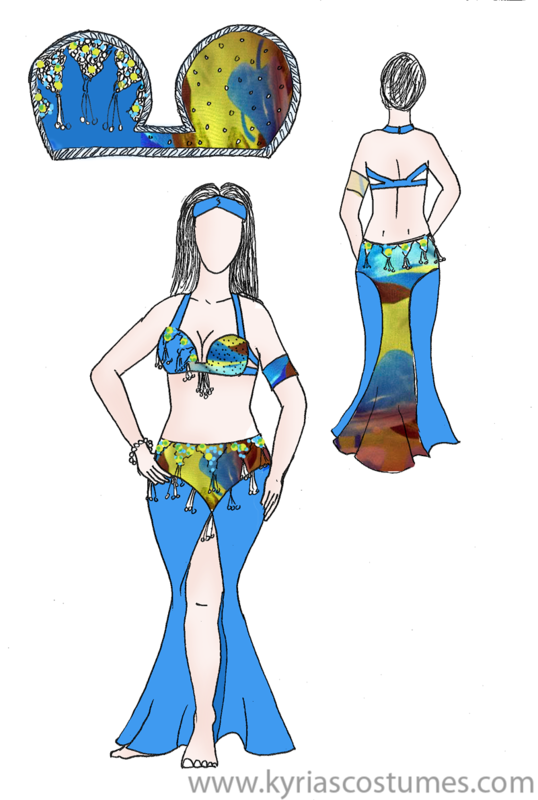 On a local hafla I’d seen my teacher wear a lycra costume and some online searching helped me find more images of costumes without a belt, but with a beaded skirt instead. Remember that Dutch dancers at te time were not wearing the newest costumes from Cairo. To be honest, very few are wearing the latest fashion now, though the numbers are growing. I had never seen a lycra costume up close, or how the beading was done from the inside. 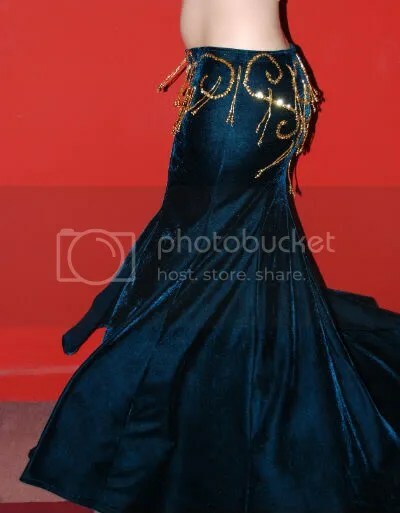 Embarking on the quest to making a costume from stretch velvet was a real challenge! 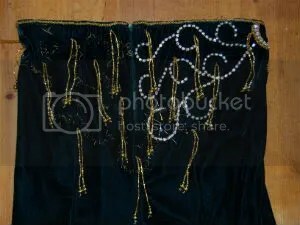 In the summer of 2006, I made a mermaid skirt from the fabric and marked the beading pattern with white thread. I made the waist sightly assymetrical, but ran into trouble when I wanted to add the zipper and/or elastic to the top. Should I made a casing? It was not the best option for an assymetrical waistline. 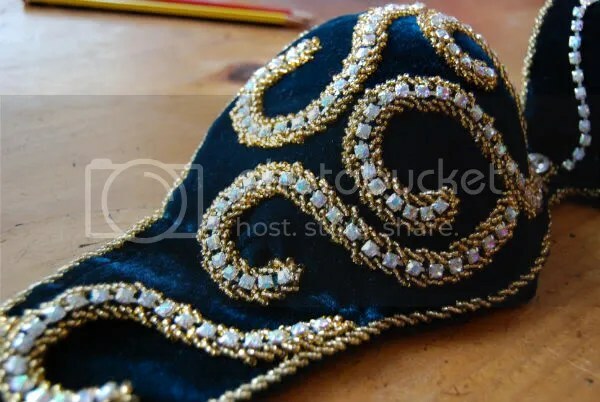 Should I sew elastic onto the velvet? But I didn’t know how. The skirt ended up in my unfinished projects pile and I moved on to other endeavors. 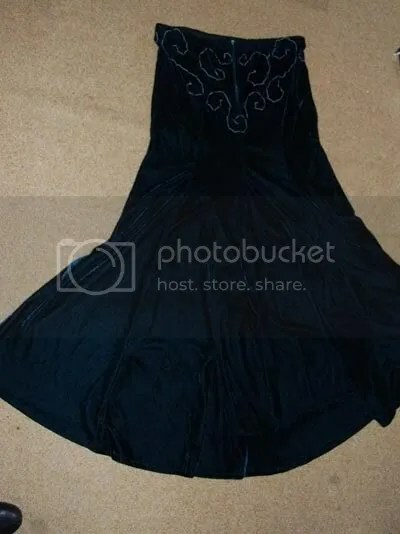 While I soon afterwards mastered sewing elastic into lycra skirts, I also discovered the joy of online purchases and lurking on the Bhuz swapmeet. In the meantime, the skirt was sitting there, alone but not forgotten. Back to 2011, a new year and a fresh start. In the past five years I’ve become a professional dancer (yay! ), finished a Master’s degree and worked full-time in a completely unrelated day job. It’s time to get the old ghosts out of the closet. I started digging in my unfinished business and found this skirt. I have a strong emotional attachment to this project, because it reminds me of who I was not so long ago. Throwing away was not an option, I had to finish it. Honestly, I don’t know how often I will wear this costume once it’s finished. And truthfully, my taste in costumes has changed since then, so this costume is not typically me either. I’d classify this costume as an intermediate costume, not a pro costume, looking at today’s market. Despite all that, it’s still a fun project to work on and one I want to finish. I’m happy that I’ve finished the skirt. Next I’ll focus on making the bra and gloves. Today I’m sewing a lot of tops, pants and skirts from crushed velvet and other scraps that I have lying around. The new teaching job demands pants instead of skirts so my students can watch my footwork. I never knew I did so much floorpatterns and feetwork, but it’s neccesary to keep people moving around. Must be all the jazz-ballet training I did between age 9 and 16 that makes a grapevine seem like a logic set of steps.